With the recent addition of Ow.ly, you can also take HootSuite mobile. Ow.ly has a Safari tie-in for iOS that helps users shorten links directly on their handheld device and broadcast using HootSuite. We think that that is pretty neat. However, HootSuite isn’t just a social network (and now other services) publisher. It helps organise entire ad campaigns for companies such as Pepsi and The White House (Yes, that one). 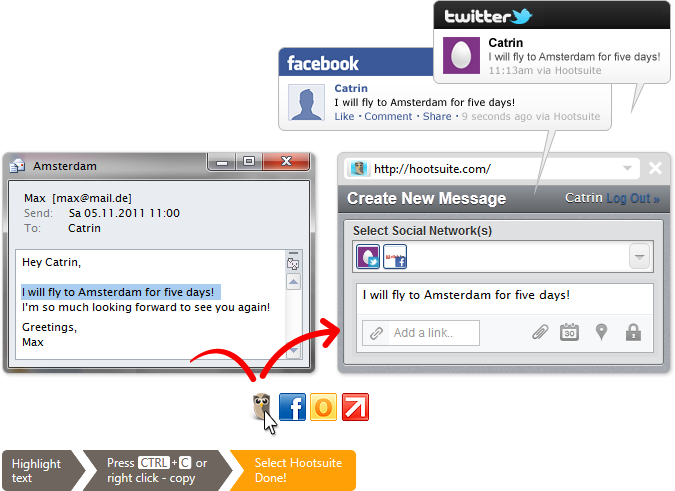 HootSuite allows its users to organise teams and gives each of those teams members access as the company sees fit. (That means if you want Hank to stop drunk tweeting on the company Twitter page, HootSuite can be used to restrict his access.) That’s a good thing! 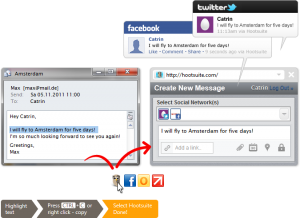 The new click.to version with HootSuite integration is now available to download, or you can just click on click.to in the system tray and search for updates.